Scientists aren’t sure exactly what causes myopia but they’ve narrowed it down in recent years. Many studies have found that children that grow up in an urban environment are more likely to be nearsighted than children in a rural environment. Recently, studies have found a strong correlation between myopia and a lifestyle of deskwork, a.k.a. near-work or close-work. In 2008, Rose et al. 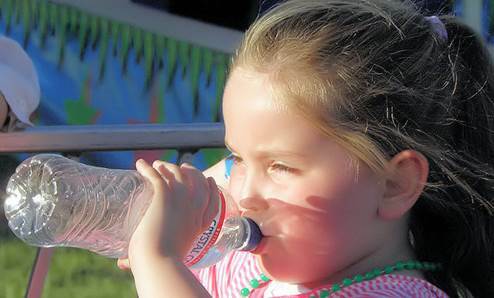 published a study that said it’s not the deskwork causing myopia but rather the lack of outdoor activity. This study took it even further and found that eyes stay in good shape not from focusing on distant objects but rather from sunlight hitting the eyes. Remarkable!! Meanwhile, parents today are still telling their kids to eat carrots and not read in the dark. Both of which do absolutely nothing to prevent myopia, by the way. Based on this “outdoor sunlight” discovery, in 2012 Morgan et al. hypothesized that there exists an inhibitor to eye growth that is activated by light, which they called retinal dopamine. In other words, they believe myopia occurs when an “anti-elongation” chemical within the eye fails to turn on. I believe Morgan’s hypothesis is close to the cause of myopia but still off the mark. To me it seems farfetched that a chemical from within the eye could change its physical shape. A more plausible explanation would be a physical force from outside applying pressure on the eyeball, which is in fact slightly gelatinous, thereby causing it to elongate. Does such a force exist? And how could it possibly be supported by the new study that found that sunlight from outdoor activities prevents the progression of myopia? When Morgan et al. formed their “retinal dopamine” hypothesis, I don’t think they took into account the way we cope with sunlight beaming into our eyes. We squint! Squinting can limit the amount of light that enters the eyes. The orbicularis oculi muscles surround the front of the eyes and are responsible for squinting. 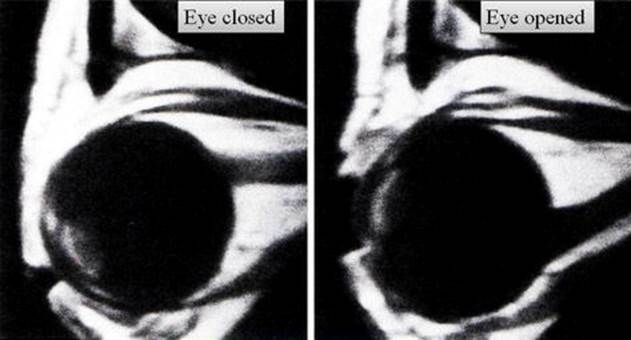 Side-view MRI of an eyeball from a person with healthy vision. Myopia is a major issue for urbanization. See, in a natural world, wind, dust, rain, sunlight, glare, cold weather, etc. would force us to squint. These elements still affect people in rural areas—heathy vision. For people in urban areas, however, modern buildings have overcome the elements. Most people work and play indoors, usually staring at screens all day. And when a screen is too bright, we still don’t squint! We just lower the brightness. If there’s too much sunlight, we put on sunglasses. 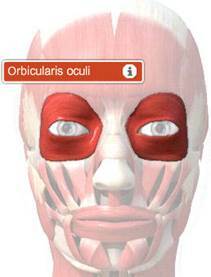 Limiting the amount of incoming light is one way to use the orbicularis oculi muscles. The other is a social construct: grimacing and smiling. Today, myopia affects about 85% of young adults in school in major urban cities in China, Taiwan, Hong Kong, Japan, Singapore, and South Korea. This is no surprise to me because, compared to other cultures, Asians today seem to spend the most time indoors (doing deskwork) rather than outdoors. Asians also seem to be more stoic and less facially expressive than other ethnicities. Many studies have shown that doing outdoor activities produces healthy eyes, and doing deskwork all day produces myopic eyes. But how do I show that it’s not sunlight—not “retinal dopamine”—but rather frequent use of the orbicularis oculi muscles that produces healthy eyes? By separating the squinting action from light. Scientists have actually already done an experiment with baby chicks in the dark. They beamed light into the eyes of some chicks and found that the ones that never received light eventually developed myopia. This doesn’t help me, though, because I can’t tell a baby chicken in the dark to repeatedly squint on command. I can use wind instead of light, however. 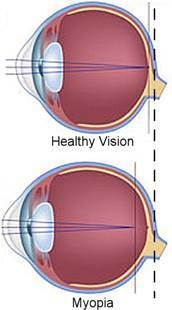 I’ve recognized two ways to identify if someone has excess orbicularis oculi fat and therefore should have myopia. One, a particular area below the (supposed) tail of the eyebrow and above the eyelid will have a round, swollen appearance. This is nearly impossible to see from a front-on view but easy to see from a profile view. 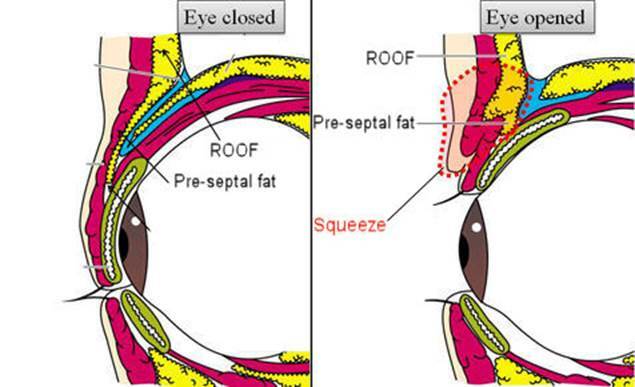 A patient before and after retro-orbicularis oculi fat (ROOF) removal surgery. According to my hypothesis, the amount of ROOF fat should strongly correlate with the degree of myopia. In other words, the chubbier this area looks, the blinder they’ll be. Easier than looking for a bit of fat, in my opinion, is to recognize weak orbicularis oculi muscles (from disuse atrophy). If hair at the tail of the eyebrow is sparse, then he/she has a weak orbicularis oculi muscle. I believe this method for identifying myopia-afflicted people is much easier to use on Asians because most Asians are neither genetically predisposed to a bony brow ridge nor extremely hairy. As I hypothesize, the fewer “eyebrow tail” hairs a person has, the more myopic their eyes. This method has limited scope in today’s society because many women pluck and draw their eyebrows. Why have I focused on the tail of the eyebrow area? 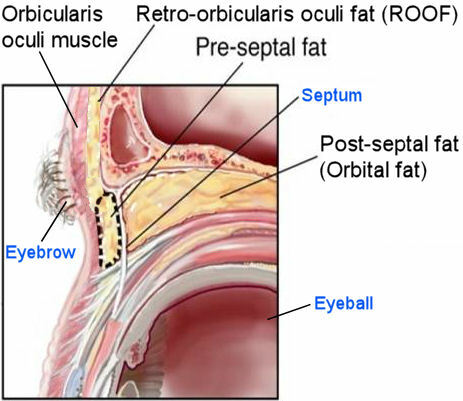 Because here, the orbicularis oculi muscle (d) and its fat are isolated. 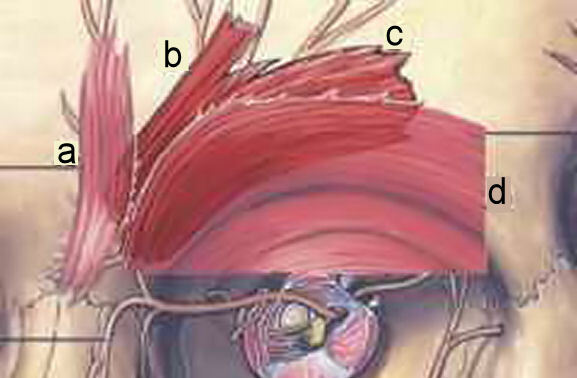 At the other end of the eyebrow is also the corrugator supercilii muscle (c) and depressor supercilii muscle (b). These muscles contribute to brow ridge protrusion and eyebrow hair density. Even if you don’t believe me on orbicularis oculi muscle disuse, you should believe the data collected from numerous studies that shows a strong correlation between light hitting the eye and healthy vision. Thus, the best way to prevent myopia would be to do things outside—sunglasses off, of course. If outdoor activities aren’t possible then my hypothesis comes in handy. Do some squinting exercises every day. This is incredibly difficult to do for a long period of time, however. We need something to make the orbicularis oculi muscle contraction an involuntary action, as nature does, rather than a conscious action, such as exercise. One possibility would be taking the lampshade off your lights and having light beam into your eyes. Note that simply closing your eyes is different than squinting. Holding a squint strains the orbicularis oculi muscles while closing your eyes does not, which is why we can sleep in peace. An extreme preventive measure would be excising ROOF, preseptal, and postseptal fat. Ideally this procedure would be done at the first sign of worsening vision—-0.25 diopters. It seems that the eyes are susceptible to shape change until your early 20’s. (Myopia stabilizes at this age.) An elongated eye seems to retain its shape, thus the possibility of reversing, or curing, myopia is out of the question.